With a focus on patient care and prevention, we offer a range of high quality dental treatments to both NHS and Private patients. As a team we work together to deliver exceptionally high standards of preventative dentistry and oral care in a relaxing and friendly environment. Market St Dental Care welcomes anxious and nervous dental patients, we treat each patient individually and take time and care to help you achieve the smile you want. We are currently accepting new NHS, Private and Denplan patients. 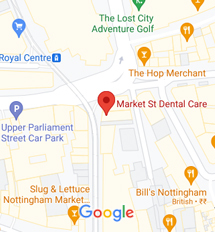 The practice is conveniently located in the heart of Nottingham City. It is easily accessible, with the city’s tram system virtually on our doorstep.